Here is the house - about 5 years ago . When the owners finish working on it, I'll photograph it again. Its form - 2 stories, one room deep, 2 rooms wide with a center entrance - was by 1790, a design in use for over 100 years. Over that time placement of the chimneys and the fireplaces had changed, first to the center and then to the rear of of each side - allowing a central hall where the chimney had been - as is seen here. The original floor plan is seen in the Locke Tavern, c. 1740 -to the right. It has its 2 fireplaces and central chimney in the center behind the stair. The plan consists of 2 equal squares - on the right side in red - and a square rear wing to the lower left. Note the location of the corner windows -'d' - determined by the diagonal and the arc of the length of the side of the square. The plan of the Reading house, 50 years later, is also made up of 2 squares -in red. 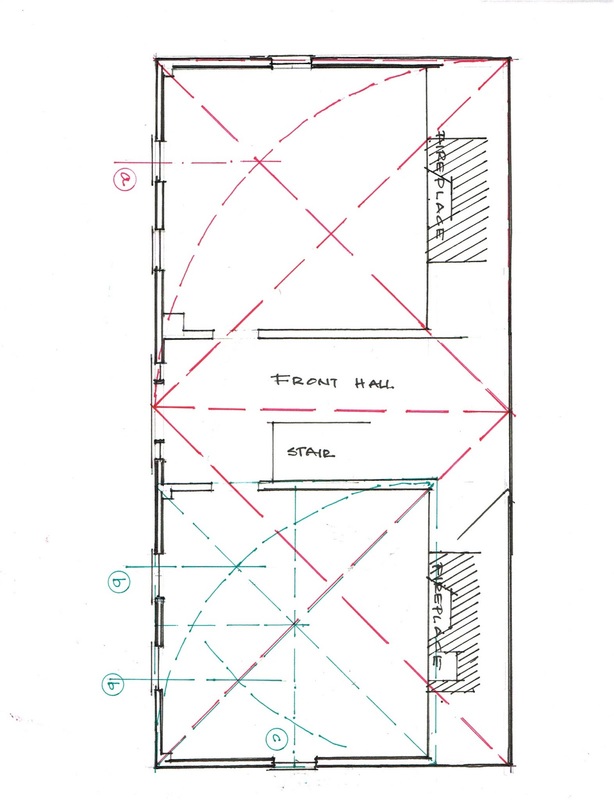 The placement of the outside windows on the front facade - see 'a' - is similar to the Locke Tavern placement on the side walls – ‘d’. The second windows in both houses seem to be set by how the house will look from the outside, not how a room will feel inside. Or the rectangle may have determined framing dimensions. The appearance might have been secondary, as it was traditional and what was expected. . The placement of the chimneys and the center hall has complicated the relationships. 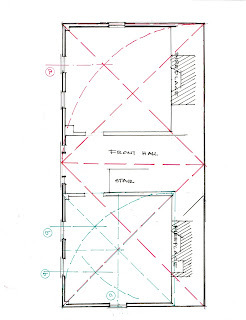 The front hall requires enough width for a stair and passage to the back wing, about 8 feet. The fireplaces make the rooms shallower than the box of the house suggests from the outside. The square and its proportions needs to be adjusted, tweaked. The contractor and I know from working on the house that the hall is bound on each side by 8”x8” beams. This is not seem in the rhythms of the exterior, but does create the square rooms on both floors. The first floor formal room - the top room - is square, its fireplace centered on the back wall. However,the second front window is not quite within the symmetry of the first by about 3 inches. The side window does sit on the center line of the square of the room -see 'c' in green - on both sides. 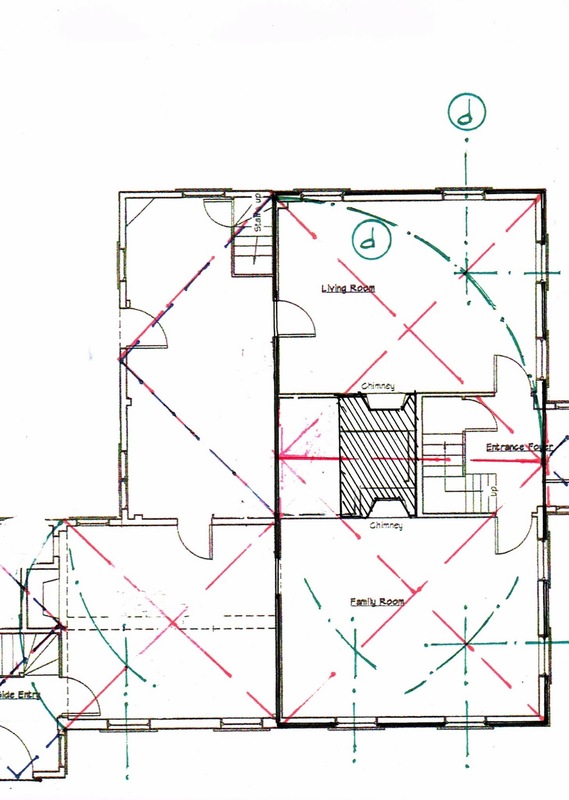 The room below - outlined in green - is 3 inches longer in one direction than the other. It has a cooking fireplace with a brick oven on the right side. The front windows are almost symmetrical to each other, but not quite: off again by a few inches. 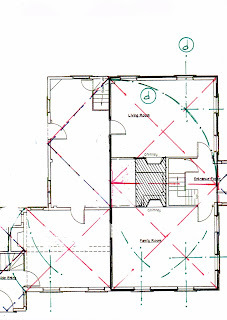 They also don't quite sit on the lines dividing the room into the parts of the rectangle -see 'b' in green. The small squares within the larger one which seem to define the window placement on the exterior - see previous post - seem not to be part of the interior layout. Nevertheless, the rooms are lovely. They feel fine. Why? I think the symmetry overrides our ability to see the imbalance. And the imbalance is too small. 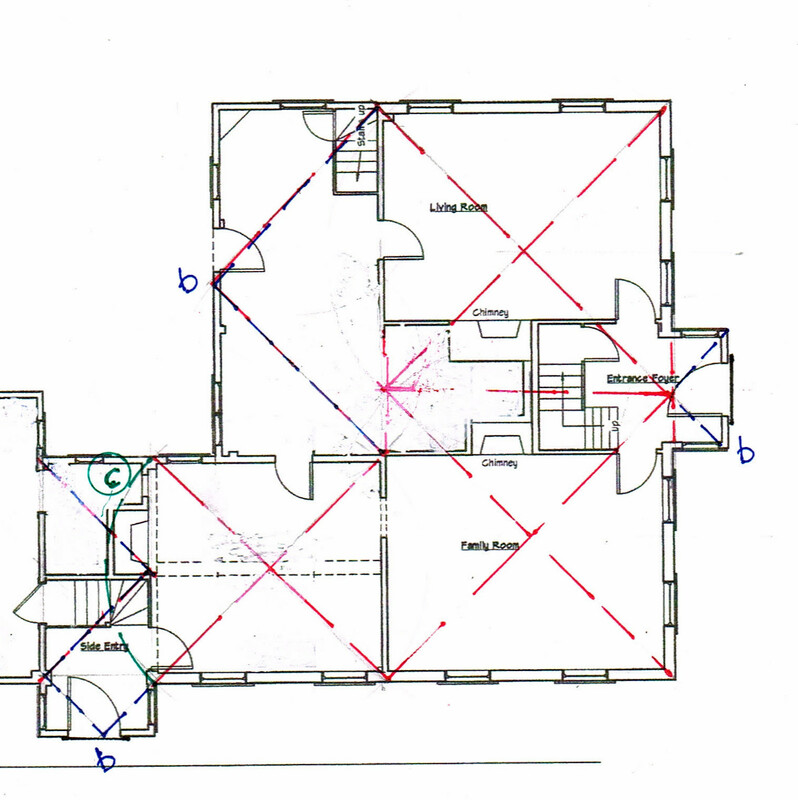 I have measured many rooms in old houses that feel symmetrical but are not. While a row of paintings hug with uneven spacing would be immediately noticed, somehow we have trouble distinguishing 3 inches of difference at the scale of a room. Surprisingly, 4 inches of difference is obvious, easy to catch. 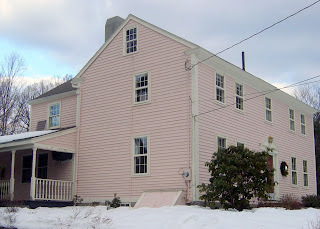 To read about the design of the front entrance, see my '1795 House' posts from late 2009 through early 2010. I love reading your thought on this subject. I am always talking to other builders and designers about the golden mean and natural proportions. I am really taken aback by how many designer/architects don't think about it more in there work, and when I bring it up among contractors, they look at me like I have two heads. As of late, I have had several "GC" and a "timber wrights" comment about not needing an architect or designer on there jobs. In each case they are adding onto vintage frames. I explain that they really do, if they don't have a design/art back ground at a minimum. They ask, "why?" I ask if they know what the golden section is...they don't, and I then I explain what it is, and why they shouldn't be doing the design work. Look forward to your next piece. The earlier posts on the Locke Tavern illustrate your point. The c.1740 house was updated about 1790: larger windows, a hip roof instead of gable, squaring of the house, entries. They work because the later builder respected and played off the original use of the Golden Section. I think timber framers and GC's can learn to use the Golden Section. After all their fore-bearers - the master carpenters - used it. Many architects don't know how to apply it if they know about it at all. PS - Jay: I hope you'll read the first post on the Reading House, posted the same day - it shows a way of applying the Golden Section I've never seen.